Wireless carrier T-Mobile has implemented “automatic scam protection” for its customers. This means that T-Mobile users who have elected to receive a phone call for Duo Multi-Factor Authentication (MFA) will see a “Scam Likely” notification on their Caller ID for the Duo confirmation call. Use the Duo Mobile app or passcode to confirm your identity for Multi-Factor Authentication. If you select “Call Me” for your notification, go ahead and answer the “Scam Likely” call coming in immediately thereafter. Once a phone is registered with Multi-factor Authentication, attempts to access University systems that utilize this technology require a user to confirm their identity by using a simple application on the registered smartphone, via a text message, or answering a phone call to any of your registered phone number. Further protects sensitive data, even in the event that a NetID password has been compromised. Helps mitigate phishing attacks by preventing access to sensitive information. Conveniently functions on- and off-campus via a variety of phone types. Registration is a simple online process that takes just minutes to complete. Watch the training video for step-by-step instructions and to learn what to expect. Visit the Knowledge Base for solutions to commonly asked questions about registering and managing your phone with MFA. Once registered, the login process is simple. Enter your NetID and NetID password, as usual, and you will be prompted to confirm your identity through your registered phone via voice, text-message, or push notification to the Duo App. Once confirmed, you will then gain access to the system. Similar to many industry adoptions of Multi-factor Authentication, you have the option to check a “remember me” box, which will bypass the need to use Multi-factor Authentication for subsequent logins for a period of 30 days. You will however, still need to use your NetID and NetID password for each login. MFA Quick Guide providing registration tips and resources. How-to Video for a visual guide to registering with MFA. myHR Self-Service was the first University system to use Multi-factor Authentication at Northwestern. In April 2016, Multi-factor Authentication was added to NUPlans. 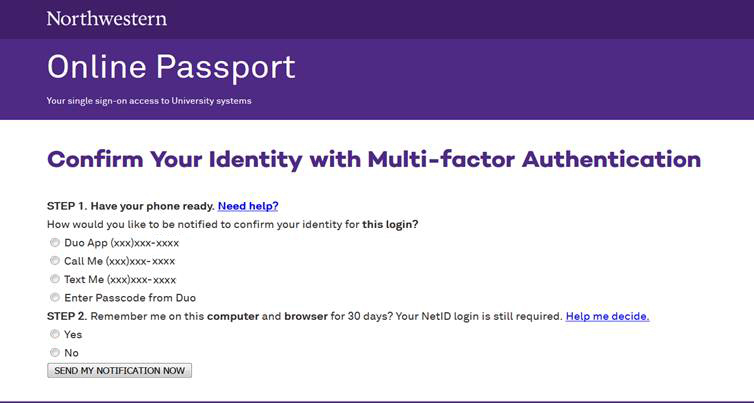 In July 2016, Multi-factor Authentication was added on several self-service University-wide systems, including NUFinancials, InfoEd, CATracks, Cognos BI, and Self-Service CAESAR. The University continues to be proactive in using various technologies to further protect personal employee data and the data of the entire University community. As members of the University community, it is everyone's responsibility to take steps to protect your NetID password that will ultimately protect access to sensitive information on Northwestern administrative and departmental data systems.